The "Leyli and Majnun" opera by great Azerbaijani composer Uzeyir Hajibayov, who laid the foundation of the first opera in the Muslim world, celebrated its 105th anniversary this January. A product of two Azerbaijani greats - composer Uzeyir Hajibayov and classical poet Mahammad Fuzuli - the Leyli and Majnun opera, which is based on a love story, was revolutionary for Oriental culture, and founded the unique new genre -- mugham-opera, which synthesizes Oriental and European musical forms, resembling a dialogue of two musical cultures of the East and West. 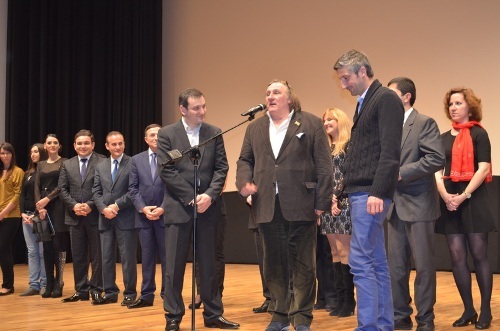 The film presentation was joined by government representatives, well-known men of science and culture, as well as popular French actor Gerard Depardieu and film producer Arno Frille. Deputy Culture and Tourism Minister Adalat Veliyev said at the event that the 50-minute film was shot in the shortest time possible - three months. After the premiere, Depardieu said he was impressed that such a wonderful film was created in such a short period of time and noted that he would be glad to help in screening any other film. He also stressed the importance of the international mugham festival being held in Azerbaijan and great interest taken in this music. The film-opera was shot at the Azerbaijan State Academic Opera and Ballet Theater and Buta Palace. Creation of a subtitled version of the film in different languages is planned as well. The film was screen-played and directed by Mahdi Mammadov. People's Artists Aygun Bayramova and Mansum Ibrahimov played the leading parts. Azerbaijani honorary artists Elchin Hashimov and Elnur Ahmadov skilfully performed the national stringed musical instruments tar and kemancha, and the State Chamber Orchestra and State Dance Ensemble accompanied the film. Rector of Azerbaijan State National Conservatory Siyavush Kerimi, People's Artists Gulbaji Imanova and Afaq Melikova also significantly contributed to the creation of the film. "Leyli and Majnun" opera is based on traditional Azerbaijani mughams, which are performed in their original form - meaning unwritten and improvised. Entire segments of the opera feature specific mughams, depending on the emotional effect the composer was trying to convey. The mughams called Mahur-Hindi, Segah, Chahargah, Kurd-Shahnaz, Bayati-Shiraz, Shushtar, Bayati-Kurd, Shabi-Hijran and Gatar are among those featured in the opera. The opera also includes harmonic choral music, which is not an indigenous characteristic of Azerbaijani music. The chorus, which is accompanied by a symphonic orchestra, was used to move the plot alongand reflect on the psychological state of the main characters. The 100th anniversary of Hajibayov's "Leyli and Majnun" was marked in UNESCO headquarters in June 2008. The event was held under an order signed by the President on holding anniversaries of significant events and well-known persons related to Azerbaijan in 2008-2009.